"We honestly believe it was fate." On the day after Hurricane Irma hit Florida, WFLA reporter Melissa Marino and her videographer Jamie Cook were out in Polk County, an area in the central part of the state that was badly affected by the storm. They'd gotten a little lost while driving around, which turned out to be fortuitous. By going down an unexpected road, they happened to hear some dogs crying. The desperate sound led them to five dogs who'd been left out through Irma. 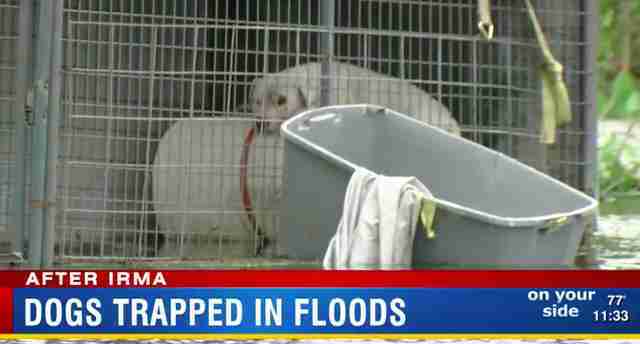 Four dogs were in flooded kennels; a fifth was trapped on top of a picnic table. Marino and Cook set out to rescue them. "All the wrong turns led to the right place," Marino told The Dodo. "We honestly believe it was fate." Marino spoke with neighbors who told her the dogs' owners had evacuated before the storm. They said the dogs had been outside without food, water or shelter through it all. Fire ants, spiders and snakes added extra danger to both the dogs and rescuers — and on top of that, more rain was predicted in the coming day. The neighbors had fed the dogs and tried to remove them — but, they told Marino, had been unable to do so safely. 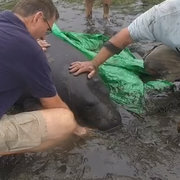 Marino reached out to city officials, and an animal control officer came to the scene. Based on an initial assessment, however, the officer determined the dogs were not in imminent danger — and declined to take them away. Rather, the officer left what county spokeswoman Carrie Horstman calls a "24-hour abandonment notice" on the home's front door. That means, Horstman explained to The Dodo in an email, animal control would return the next day "to check and see if the dogs had actually been abandoned." "If you think about it this way, the owners may have been gone a mere matter of hours," she said. "We have no way of knowing this, and we can’t just take someone’s dogs out of their yard if they aren’t there unless the dogs are in distress." "It was heartbreaking," Marino said. "We thought they were going to be rescued." Marino posted videos of the dogs, and their non-rescue, to the WFLA Facebook page and website. Some people came by the area with treats and food for the dogs. Many others expressed outrage online. Marino let Horstman know about this public outcry in response to her video. "People were angry and upset that the dogs had been 'left behind,'" Horstman said. "Specifically because her video said they were being 'rescued' by animal control, and not 'checked on' which would have been more accurate." Accurate or not, law enforcement officers decided to return to the house. As you can see in Marino's videos, they waded through deep water, retrieving each of the scared, wet dogs. It had been about four hours since Marino and her videographer first encountered the dogs. Seeing them finally saved, Marino said she just felt "relief." "It was a hard day," she said. "In between live shots I was in tears." The dogs have been taken to the local shelter. They are being held for their owners to reclaim, Horstman said — though as of Monday, that hasn’t happened. Asked if the county might pursue legal recourse against the owners for abandonment, Horstman said "the investigation into any criminal charges is still ongoing." Marino and her viewers have become deeply engaged with these dogs' lives, so she will keep checking in on them, too. "Animals don't have a voice," Marino said. "Someone has to be the voice for them." Keep tabs on these dogs on the WFLA Facebook page.